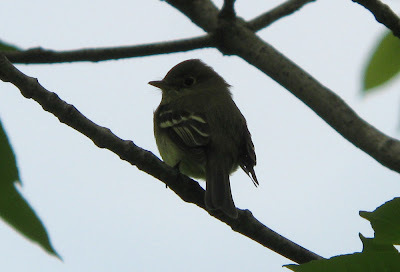 Yellow-bellied Flycatcher - Prescott, Quabbin, Franklin Co., MA. May 18th, 2009. 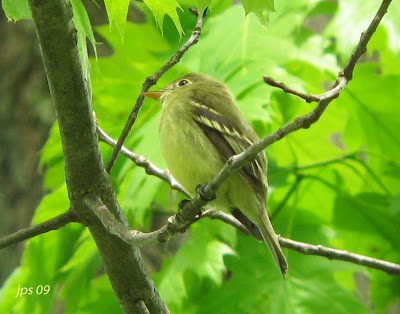 This wonderfully co-operative Yellow-bellied Flycatcher put on a fine show at the southern end of the Prescott Peninsula in the Quabbin. 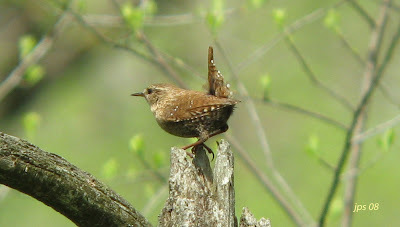 Most of my previous experiences with this species have been frustrating with birds most usually identified by song or call and giving only fleeting views. 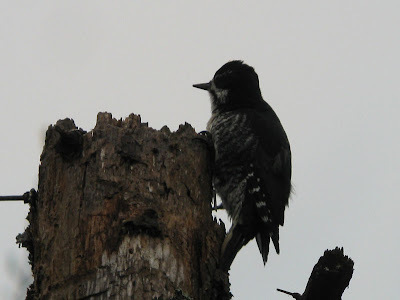 This bird was rather exceptional though, and gave what must have been my best views of the species. 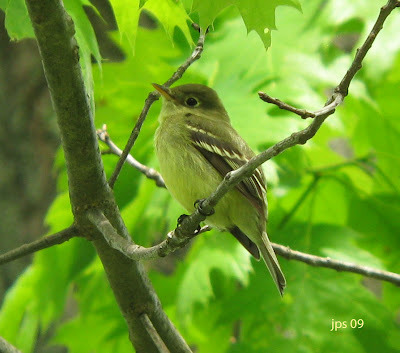 Mid to late May is a fine time to detect migrants destined for the Boreal forests and Northern woods passing through Massachusetts, and this bird fits right into that pattern. Other birds around today included several Blackpoll Warblers in Amherst, plus Evening Grosbeaks, Cerulean Warbler, Yellow-throated Vireo and Winter Wren all in Central Quabbin. This morning was comfortably cool, bright and sunny. Not really the sort of conditions where I'd expect to find a good variety of migrants in the local neighborhood but some of today's species are worthy of note. 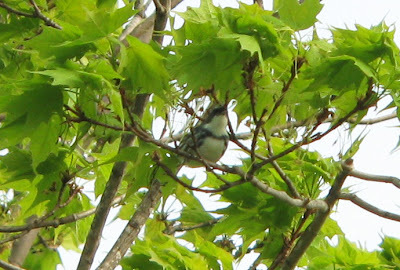 A Bay-breasted Warbler singing on North Whitney Street was my first of the year, as were a couple of Blackpoll Warblers up near Orchard Hill on the UMass campus. 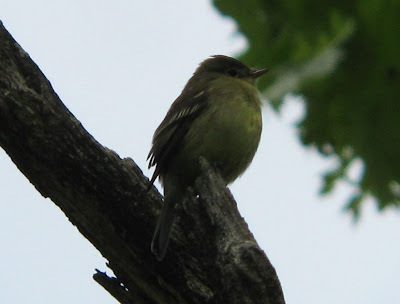 The real highlight though was a singing Acadian Flycatcher in a yard on Chestnut Street north of Amherst town center, my first locally for the year. 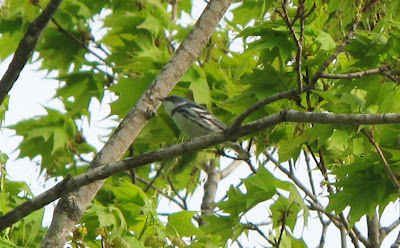 Other nice species included Magnolia and Blackburnian Warblers and Swainson's Thrush in our yard on North Whitney Street, a Yellow-throated Vireo (first one on April 28th) on the Amherst Bike Path at Snell Street and a Louisiana Waterthrush on Henry Street, North Amherst, the latter present since at least April 24th. All of these were recorded under human power, either by foot or bicycle. Yesterday, May 14th, I also came across a migrant Lincoln's Sparrow in the Northern part of the Prescott Peninsula, Quabbin. An interesting chickadee found whilst looking for Boreal Chickadees at Moose Bog, Wenlock WMA in the North East Kingdom, Vermont. 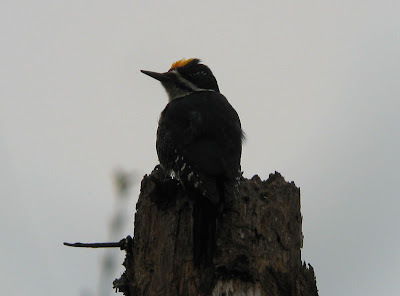 This bird's unusual appearance prompted the question of hybridization between Boreal and Black-capped? A request for information on ID Frontiers revealed that there are apparently no fully documented cases of hybrids between this particular species pairing. 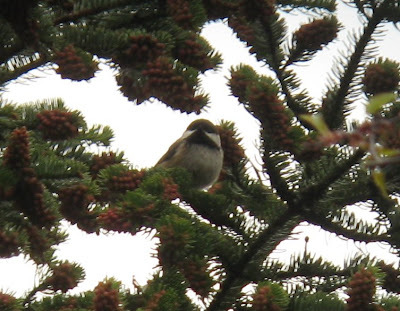 This bird was foraging close to two Black-capped Chickadees but responded immediately to sound recordings of Boreal. 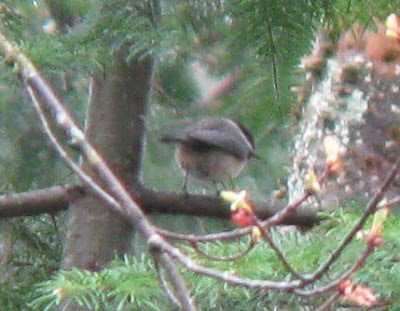 Although the digiscoped images (taken in dull overcast conditions) are rather poor they do reflect much of what I experienced in the field - a bird somewhat resembling Boreal Chickadee but lacking the brown-cap and gray neck sides of that species, and showing a rather white-cheek similar to Black-capped Chickadee. 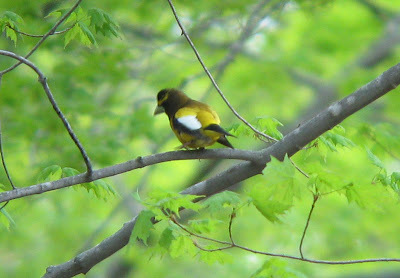 In the field, the wings appeared near uniform lacking the white edging to the secondaries and greater coverts of Black-capped and more closely resembling Boreal. 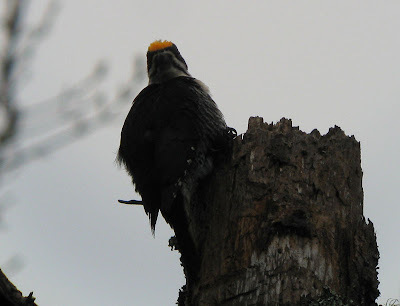 At all times the bird appeared black-capped, though the images show a subtle brown tone to the top of the crown which I didn't see in the field. 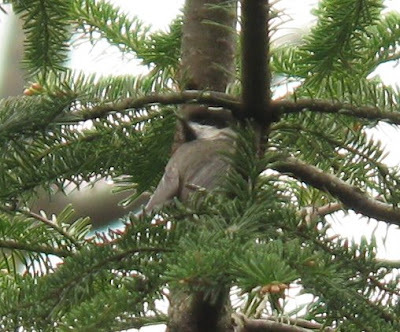 Further odd features include a clear contrast between the black cap and the mantle, and rather weakly colored buffy flanks (not rich buff as in typical Boreal). I left the bird feeling quite puzzled and thought about the hybrid question even before I'd had chance to look over the images. 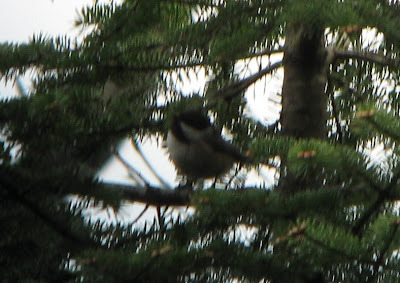 Although I don't expect the images to be in anyway conclusive, they do appear to show a reasonably good candidate for a Boreal x Black-capped Chickadee hybrid. I'm very grateful to Peter Pyle, David Sibley, Cameron Eckert and Steve Mlodinow for commenting on hybridization in chickadees and for offering to comment on these images. 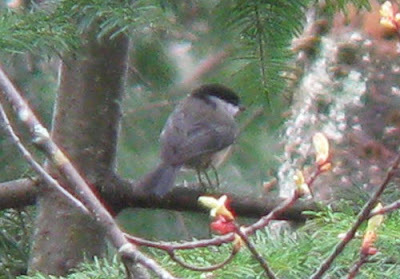 possible Boreal x Black-capped Chickadee, Wenlock WMA, Essex County, VT. May 10th, 2009. We had a family trip up to Island Pond, VT over a very wet, and ultimately very cold, weekend. Even snow showers were forecast for parts of NE Vermont on Sunday! We spent much of Sunday morning walking the wet trails around Moose Bog in the Wenlock WMA. 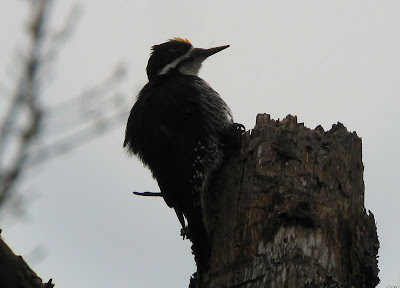 Sadly, we couldn't dig up any Spruce Grouse but eventually caught up with a nice male Black-backed Woodpecker. 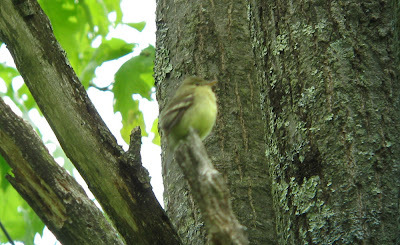 An interesting Boreal Chickadee and a Palm Warbler were other highlights. Arriving back home in Amherst, MA on Sunday evening, a female Ruby-throated Hummingbird was working the feeders - our first of the season. 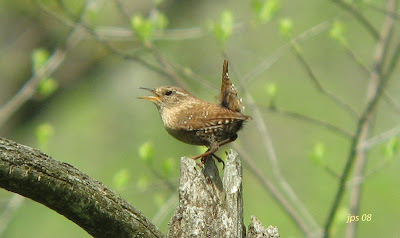 Winter Wren - Excellent views of a singing male, Central Quabbin, Hampshire Co., MA. 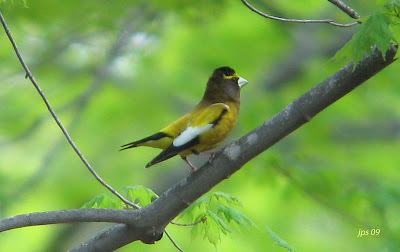 Evening Grosbeak - Male, Central Quabbin, Hampshire Co., MA. What a stunning species! 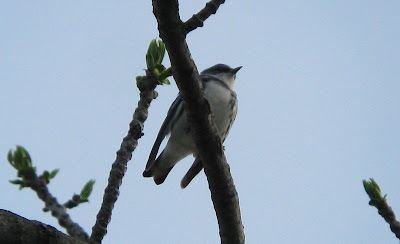 Cerulean Warbler - Male, Central Quabbin, Hampshire Co., MA. What a stunning species this is! After returning from Texas about 10 days ago I'm finally getting back into the rhythm of life at home and the emergence of the spring here in Massachusetts. Indeed many of our common migrants have arrived already, perhaps about a week ahead of normal schedule. 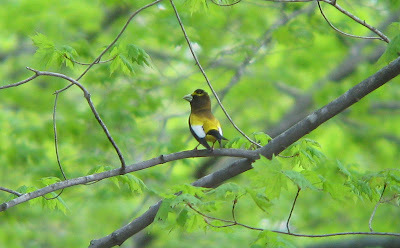 But.......today's low pressure system bringing muggy South-westerlies and some locally heavy rain showers brought some good birds to a couple of spots along the Connecticut River Valley. 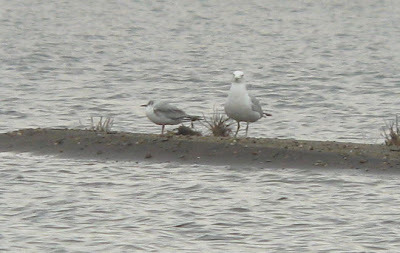 A first-summer Bonaparte's Gull rested on a small sandy island with Ring-billed Gulls at Northampton's Oxbow Marina, and later in the afternoon I came across no less than six Red-necked Grebes together at Barton Cove, Gill. 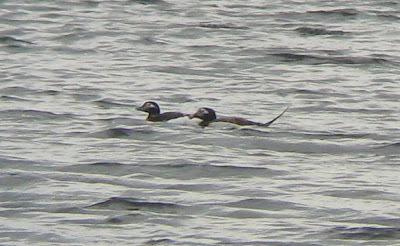 With the grebes came two summer-plumaged Long-tailed Ducks! Much to my surprise, over 100 large gulls were present at Barton Cove as well, almost all of them first and second cycle, and over 85% Great Black-backed Gulls. Bonaparte's Gull - first-summer, Oxbow Marina, Hampshire Co., MA. May 1st, 2009. 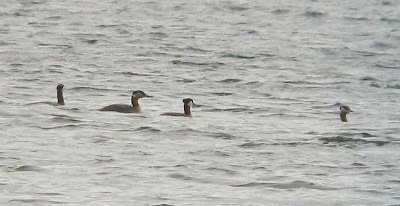 Red-necked Grebes - Barton Cove, Gill, Franklin Co., MA. May 1st, 2009. Long-tailed Ducks - Barton Cove, Gill, Franklin Co., MA. May 1st, 2009. Six Red-necked Grebes and 2 Long-tailed Ducks Barton Cove, Gill, Franklin Co., MA. May 1st, 2009. 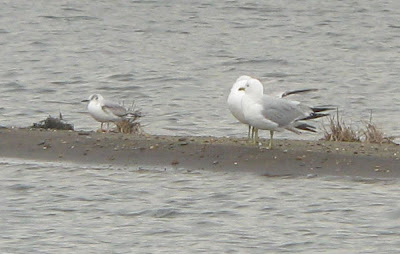 Great Black-backed and American Herring Gulls - Barton Cove, Gill, Franklin Co., MA. May 1st, 2009.